Bing's homepage is wonderful today. Right now, it livens up your basic search page with an animated timelapse of concentric startrails at Monument Valley in Utah. It's gorgeous. But more importantly, it's the kind of tasteful-but-futuristic design we want to see more of. Today, the undisputed face of the web is Google's homepage. It was (is!) so refreshing because of its minimalism in a time of design element cacophony and remedial illustration. It was simple. It felt less like browsing the bathroom wall at a concert venue than anything else out there. When Google's homepage was being built, Sergei Brin famously whipped up the page, saying "We didn't have a webmaster, and I don't do HTML." (They also misspelled Googol.) Accidental genius: The web was inherently ugly, and less of that ugly was better at the time. But the world's changed in the past decade and a half. In one of the unlikeliest reversals of the century, Microsoft might be the most trustworthy arbiter of design in tech right now. Skip over how unbelievably insane that is and accepting that fact opens us up to beautiful new possibilities—like this Bing page. Redmond has been pumping out good design that can feel futuristic without seeming tacky. It's reminding us that the web can look nice without being dull. Even boring old Google has been getting into the game. 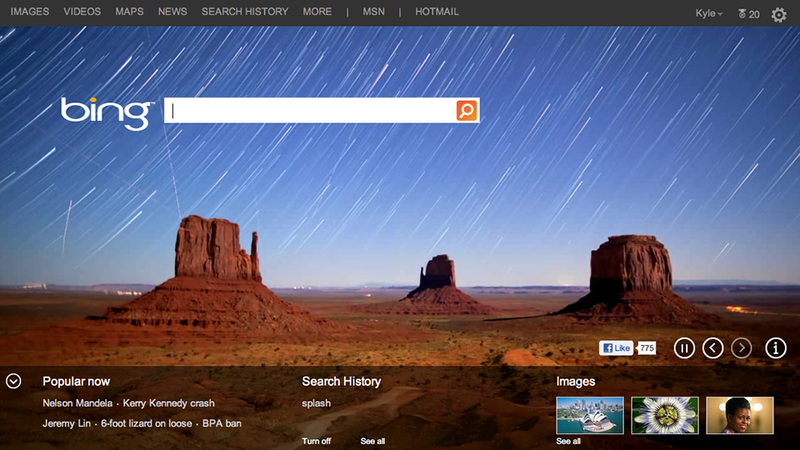 The overall new design for the Bing page has been around for a few months now, but this is the prettiest we've seen it. The strong points are many: information density, trending topics, interesting visuals, transparency about social integration with clear distinctions between social and organic searches and easy opt-outs. The one gripe you might have, if you really must have a gripe, is that the (very useful!) mouseover information Easter Eggs found when hovering over the four boxes on the page aren't as intuitive as, say, a Google Doodle. But that's not too steep a price to pay for a homepage from the future.